Fairy tales, myths and legends are part of every culture - so it's only fair that lesbian culture gets a few. If you'd like to read about a re-imagined Rapunzel, a sapphic Snow White or a gay Ariel, or a wide assortment of women from many different traditional stories, take a look at the anthologies and novels listed below. Some I've read (and reviewed), some I'm still getting around to. But if you're looking for a list of alternate fairy tales, this is the place to start. Most of the lesbian fairytales tend to be found in themed anthologies - many of them erotica. This is a quick list of all the ones with reasonable reviews (or in some cases, none. But none of these have bad reviews overall). Sleeping Beauty, Indeed & Other Lesbian Fairytales is a splendid mixture of stories retelling ten different obscure or well known fairy tales and adding a very lesbian spin. A couple of absolute gems here, and definitely worth the time to read. For a better idea of the book, check out the review. Fairytales for Femmes is not about particular fairy tales, but is a collection of short stories that follow the 'happily ever after' fantasy fairytale formula. With Femmes. And very good reviews. Other well-reviewed alternate fairytale anthologies that are heavier on the fantasy than the erotica are Kissing the Witch: Old Tales in New Skins by Emma Donoghue (reviewed here), The Spindle and Other Lesbian Fairy Tales and So Fey: Queer Fairy Fiction (which also includes gay male stories). Once upon a Dyke: New Exploits of Fairy Tale Lesbians contains four erotica stories featuring well known fairy tale characters. While I haven't read this one yet, the authors are fairly recognisable and the reviews are favourable. They followed Once Upon A Dyke up with Bell, Book and Dyke: New Exploits of Magical Lesbians , which follows the same format. The Huntress and the Doe is short story based on 'The Snow Queen' by Selene Coulter. It currently has no reviews. The Rose and The Beast: Fairy Tales Retold by Francesca Lia Block (author of the award winning Weetzie Bat stories). Fairly dark retellings of the usual fairy tales, many with lesbian protagonists. While it's not a particular retelling of any story in particular, Adijan and her Genie has all the elements of Aladdin, or other 1001 Nights tales. It's also an awesome story. You can read the full review here. Malinda Lo's first two young adult books are both heavily inspired by fairy tales and mythology. While the sequel, Huntress, is a bit of a mixed bag of mostly Asian fairy tales, the first book Ash is recognisably a fey Cinderella story. Read the review of Huntress and the review of Ash. The Dark Wife by Sarah Diemer retells the Greek legend of Persephone, who falls in love with the goddess Hades. It is a splendid retelling and worth reading both for the romance and the mythology. Four books (so far) featuring fun, action filled adult fairy tale retellings. Three princesses - two in exile, one happily married, go on fairy tale influenced adventures to save themselves and the Kingdom. One happens to be a lesbian, and - though this doesn't really feature in the first book - this turns up regularly throughout the rest of the series. Another book by L-J Baker, Promises, Promises is more of a fantasy parody, but it includes plenty of fairytale elements. And dykes. Read the review. This book by Chris Anne Wolfe is a charming and romantic retelling of the well known story of Beauty and the Beast. Definitely worth a second look, and you can read the full review here. Goose Girl by Giselle Renarde is a HIGHLY NSFW and humorous take on the traditional Goose Girl story. The princess is bisexual, beautiful and horny and her royal parents were both women. Alice & Dorothy by J.W. Schnarr is a modern, horror version of Alice in Wonderland, who's joined by Dorothy from the Wizard of Oz. Queen's Champion: The Legend of Lancelot Retold (From the Lion Fairytale Series) by Chris Newport & Edward Jr. Beard is a story that focuses on Guinevere and Lancelot. Only this Lancelot has a secret... and a pretty obvious one, giving that it appears on this website. Sleeping Beauty-a Lesbian Fairy Tale was published in 1972 (the revised edition in 1978) and is listed as a landmark title in LGBTQ publishing, but I can't find a synopsis anywhere. As it's 30 pages long, and illustrated, it may be a children's picture book. Drawings by Gail. Words by Vicki. Calligraphy by Ginny. A series of lesbian fairy tale novellas written by Elora Bishop and her wife, Jennifer Diemer. They will be available individually and in anthologies. Check out their blog for more information. And a final collection titled Snow White Loves Rose Red. 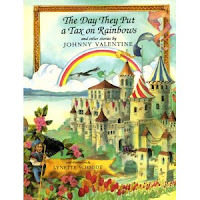 The Day They Put a Tax on Rainbows by Johnny Valentine, illustrated by Lynette Schmidt (Alyson Wonderland). A collection of alternate fairy tales/fables, featuring a mixture of lesbian and gay male parents. Check out The Second Mango (and sequels!) by Shira Glassman. Jewish fantasy starring a young lesbian queen with food allergies, themes of found family and female friendships in addition to happily-ever-afters for all LGBTQIAP+ characters.